Six months ago I was really lucky to be one of 4 individuals chosen to be part of DVLA’s first digital talent pool. Working at DVLA for 2 years I never thought I’d be able to use my design knowledge in a job offering me such great career opportunities. As part of the very first Government Digital Service (GDS) training day I spent 4 days in London, going through various workshops and presentations for new designers in government. GDS are continually developing these training sessions - they help build up good working relationships and networks within GDS. The sessions covered design principles, how important good research is and the golden rule to good design is to have a user centric approach. UX designers have a variety of different tools at their disposal, from pencil and paper right the way through to front-end coding software. Creative types, like me, typically find things like code a struggle to grasp. I’ve found the more I use it the more I understand the power it gives you as a designer. I fully believe you’ve got to have an in depth knowledge of a service before you even attempt to design it. Making sure you carry out good quality research before starting anything ensures your service gets off on the right foot. Throughout the design process it’s important to be able to discuss changes and ideas in a way that doesn’t take up too much time and resource. Paper prototypes are always the best place to start; they allow me to quickly sketch out page layouts and concepts before developing them into flat screens. I use a software package called Sketch to design flat screens. After building up a library of elements in Sketch, including buttons, fields and icons, mocking up flat screens and patterns is a quick and easy process. They look real enough for us to discuss the content and allow us, as designers, the opportunity to take into consideration the content and layout before making a working prototype. It also allows us to be selective on design decisions - to keep the good things and drop the bad. User-centric design is good design. Once you’ve got your initial prototype ready, it’s time to test it out on the public. It’s easy as a designer to assume you know what looks best. When your target market consists of over 45million hugely diverse motorists different factors have to be taken into account. The golden rule is to ensure we do the hard work for the user and that the user needs always come first. All in all, my first 6 months as a trainee UX designer have been interesting, insightful and educating. I look forward to the challenges ahead and further developing my skills and understanding. 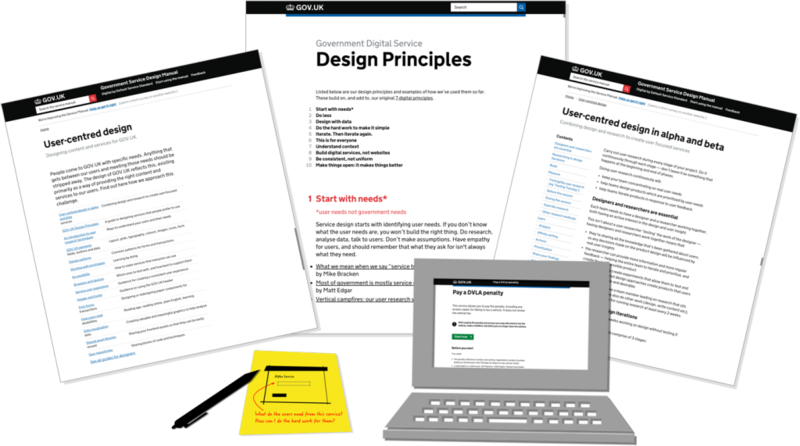 In my next blog I’ll be going into a little more detail about my experiences in digital service delivery. Particularly, the applications we use and a little in the UX@DVLA.